She Said, She Said: The Valte-Torres Alibi Gig – CHUBIBO! 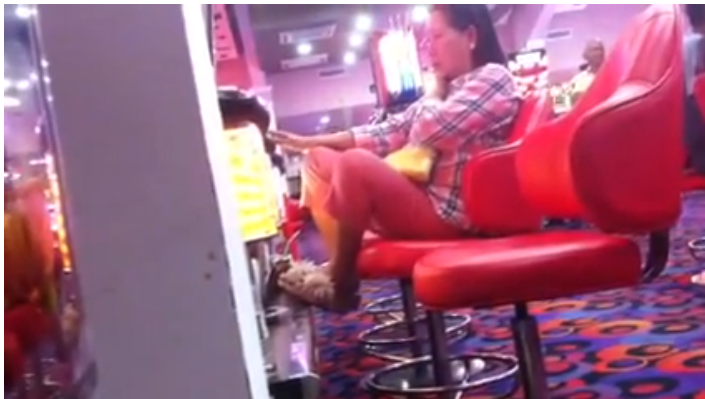 The country was rocked by a video showing the LTO chief (and PNoy kabarilan) Virginia Torres positioned by a slot machine in a casino. This is clearly in violation of Memorandum Circular No. 8 issued by the Office of the President in 2001 that prohibits heads of agencies and departments from staying or playing in casinos. The circular says that the following persons are not allowed to stay and/or play at the gambling casinos: government officials connected directly with the operation of the government; members of the Philippine National Police (PNP), Armed Forces of the Philippines (AFP); and persons under 21 years of age. Additionally, the religious sect to which the LTO chief belongs absolutely disallows gambling in any form. The anger rose… and the alibis started flying all over the place. Palace Deputy Spokesperson Abigail Valte and LTO Chief Torres took turns in boldly attempting to dissipate the public outrage with their explanations. Yes, Virginia… God works in mysterious ways. Previous postMay bilyones pero utak bangkarote! Dito masusubukan ang moral ascendancy ng present govt na ito, kung mayroon. Ito ang kulang sa mga namumuno sa govt, kaya pati maliit nadamay/nahawa. Kung ito ay makalusot, wala na talagang pag-asa ang govt natin. Sorry ka Ms. Torres, di ka nagiingat, kita-kita ang ebidensya, sabagay hindi naman ito Japan, Pilipinas iyan kaya kapalan na lang. Bad timing ka , isa ka sa maging diversion sa Pork Barrel Scam, kaya maghanap ka ng magaling na PR , kasi kung ako diyan kila Valte at Noy sibak ka na , nabutasan kayo at tama si Duque, nagtrabaho ako dati sa govt, nuon sa PNB simple lang , resign na, sorry pahuli, modern na ngayon, puro viral hehe. no question ask, sack her! simple as that…. While waiting for the bill to be settled, I saw the slot machine on the lower floor and out of curiosity, I sat in front of one machine and marveled at the lights and read the instructions.and started playing up to wee in the morning and stay late in bed ang i realized that its working day never mind. this is the essence of Daang Matuwid: kapag kakampi ka at may ginawa ka na labag sa batas, abswelto ka. pag kalaban ka, kahit wala ka ginawa, yari ka!